Don't get me wrong, I love rice and potatoes as much as the next guy, but sometimes my palate yearns for a little kick in the pants in the starch department. In those desperate times, I turn to two new friends: couscous and quinoa. 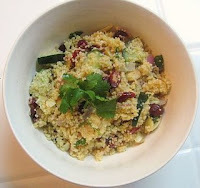 Couscous is a middle-eastern wheat-derived grain. Quinoa (pronounced keen-wah) is an ancient protein-rich grain that humans have been eating since we were dragging our knuckles on the ground. Both are nutritious, delicious, versatile and very quick cooking. The modes of preparing these bad boys are only limited by your imagination-- you could just chop up an onion and some garlic and throw it in the pot while they're cooking, throw some tomato sauce and steamed veggies on top and call it dinner, or they both make great side dishes with fish or chicken. 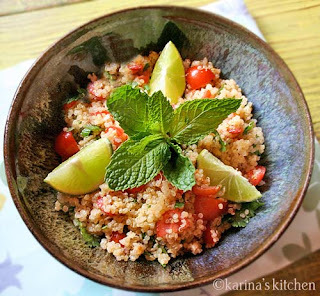 Since it's still summer, and it's sticky hot in the City today, I'm going to give you a couple cold salad recipes that make use of these lovely grains. Serve them inside avocado halves to your bridge club, or pack them up for a picnic in the park. They taste better the second (or even fourth) day, so feel free to make them ahead of time. Just don't wait another 500,000 years. 1. Rinse the quinoa and cook according to directions on package. 2. Combine the cooked quinoa with the rest of the ingredients and toss with a fork. 1. Cook the couscous according to the package directions. 2. Combine all the ingredients in a large bowl (except for the last four), and toss with a fork. 3. Combine the vinegar, oil, mustard, salt and pepper in a small bowl (or use the equivalent of a good bottled dressing), and add to the salad. Just made the Quinoa sald with everything from the garden. Now for lemonade . . .mmmmm, thanks Lily!